"Learn to quilt easier, faster and more accurately!" Once you purchase these webinars, you can download and watch these sessions as often as you'd like! Jenny Kae will take the hassle out of half-square triangles, get your geese flying in formation and make sure you keep those points. This live web seminar will show you five ways to make flying geese, four ways to make half-square triangles, three ways to match seams and an easy way of paper-piecing. 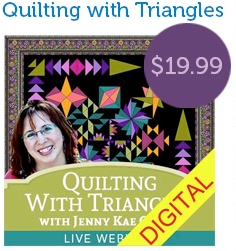 With just a few tricks and tools from Jenny Kae, you, too, can untangle the triangle. Quilt binding can be challenging and frustrating for new and old quilters alike. Have no fear, it is time to learn a new way to bind your quilts - and we're here to show you how! From start to finish, Jenny Kae shares her most-requested technique: machine quilt binding. With just a few tips and tools from Jenny Kae, you, to. will create fast, accurate and beautiful binding. 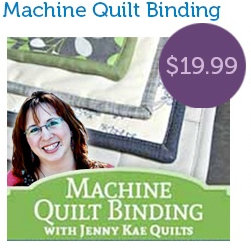 You'll never dread binding your quilt ever again! 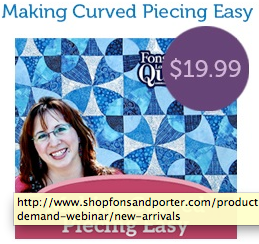 In this web seminar, Jenny Kae will show you her best tricks to make curved piecing fast, easy and beautiful. This web seminar will cover how to prepare you fabric, make templates, tracing, cutting, piecing, pressing and piecing blocks together and so much more!